Over the years, I’ve made a few DIY fly tying tools to improve my fly tying experience. There aren’t many of us anglers that enjoy spending a lot of money on gear, but there are always new tools to make your life easier. 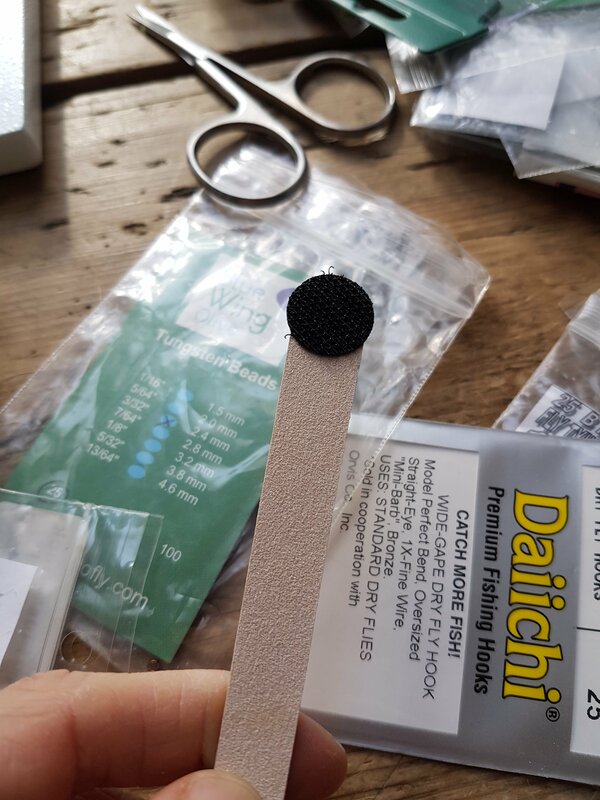 One of the simplest ways to add a little something extra to your tying is to make a small velcro tool to rough up the dubbing on your flies. 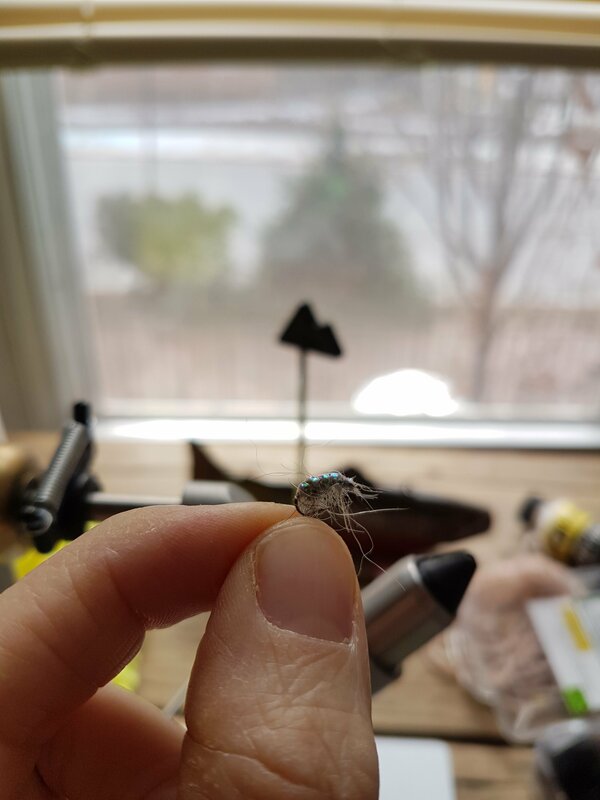 It’s a quick way to add a little bugginess to your flies that look a little too Pinterest worthy. I have flies that don’t look like anything special, but catch more trout than any other fly in my box. If you’ve ever scooped up a few bugs from the water when out fishing, you know that a lot of trout food looks like it has been eaten and regurgitated 50 times on a good day. They’re soggy and often formless. Don’t be afraid to get ugly. You’ll get less instagram likes on the flies, but you’ll wind up with more fish in your net. Anyways, on to the tool that I use! I had a few velco stickers lying around in my office, so I decided to start with those. You can find these at any office supply store or online for a few bucks. They’re small and circular, so they work well to fit into the small crevices between your fly and vise. The next step was to find a thin and long tool to reach the underside of the fly body. I wanted to use a tongue depressor, but settled for the next best thing, which is a nail file. The velcro I have actually fits perfectly on the end of the file, which is always a nice outcome. Here’s the final product! A cheap tool to keep in your tying area. Here’s a scud that I often tie and rough up the body. My hope is that it will trap air bubbles and achieve a more natural drift. Now that looks like it’s been coughed up by trout at least 50 times. Perfect. Nice looking fly, like the skin color and the buggy legs. 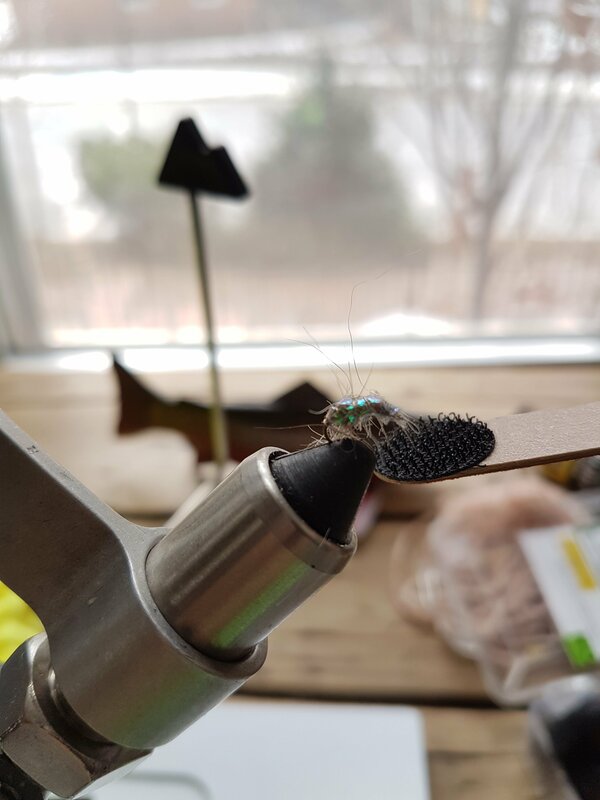 I haven’t been tying for very long, but the Velcro brush on a tongue depressor was the first tool I made when I started. I like the idea of the nail file, as sometimes the depressor is too thick to get into the hook bend. I keep my rod pieces together with strips of Velcro I get off the bunches of leaf lettuce sold in the grocery store, so I always have a strip of Velcro with me on the stream when I need to brush out the flies on the water. Another DIY tool that comes in handy for me at the vise: I thread a length of craft floss through a small needle. When I have a heavy hand with head cement, glue, or Sally Hansons I push the needle and floss through the hook eye and sort of roll the floss around the inside edge of the eye to help clean it and prevent a blocked eye. If the hook’s eye is too small, I use a piece of lead or copper wire (without the needle) to do the same. Hope you’ve been able to find some good water around your new digs. Last time I was out was on the Stillwater at the start of December; I had my elderly Dad with me, so we couldn’t venture too far off the beaten trail. Lately, it’s been way too cold here in MA – hasn’t been above 20 degrees for over a week. I’m hoping for a January thaw soon, but the forecast doesn’t look promising. Thanks Kevin. I appreciate you including your own DIY tips as well! I was thinking of doing a series, or add to this post as I have the time. The velcro brush is something I should have thought of much sooner. Believe it or not, when starting out I would sometimes rub a fly against a pair of climbing shoes I have with velcro straps. haha. I will have to look out for the lettuce velcro, as I’ve never noticed it. Nice way to keep a rod together in the back of the car. I often use a bodkin to clear cement in my hook, but your method seems more efficient. There’s another tool I’ve seen in videos where you attach a screw hook to a handle for dubbing loops. I’ve thought about making one of those, but my tool for them works pretty well. How’d you do on the Stillwater? I stopped by there in late October, and caught one smallish salmon. Saw a few very nice fish in the water up by the I-190 bridge, but they were very cautious in the shallow water. There’s a flat section just above the bend before the bridge that holds some big fish. I’d recommend checking it out if you go back. Kind of a hike though. I got out of the city for a few hours one day and fished a tailwater called the Gunpowder. I hooked one really nice fish which broke my line on some submerged debris. I learned from a local that is very common for the fish to do there, so lesson learned. Next time I’ll know to get them to the surface ASAP! There’s always an obstacle with learning new water. Love the color of the fly!